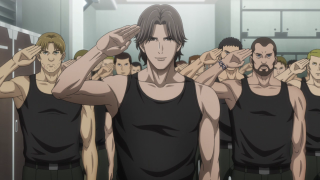 Episode 06, "The Capture of Iserlohn (Part 1)"
Synopsis: As Yang Wen-li prepares to launch his mission to capture the Empire's Iserlohn Fortress, he gathers resources and recruits. Among them are Commodores Fischer and Murai, as well as Captain Patrichev. Calsenes assigns Yang an adjunct, Sub-Lieutenant Frederica Greenhill, who recalls the time she met him on El Facil. 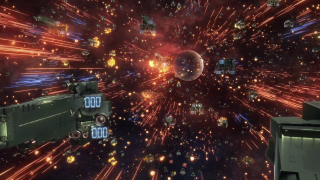 Other officers are skeptical of Yang's skills, but he's defended by the 5th Fleet Commander, Vice Admiral Bewcock. For the plan to take Iserlohn, highly skilled commandos are needed, so Yang selects the controversial infantry unit, the Rosen Ritter, commanded by Captain Walter von Schönkopf. Meanwhile, at the stronghold in space, the two commanders in charge are informed of strange activity, and speculate on whether or not it's a trap. Suddenly, they're contacted by an Imperial soldier, who requests an audience with them. This episode manages to stretch out the first half of Chapter 5 of the first LoGH novel, interestingly. 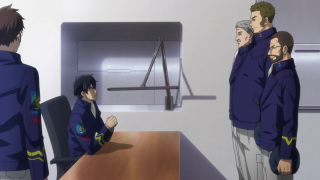 It does this mostly by changing the venue of Yang's first encounter with Schönkopf and actually show the event spoken in passing wherein Bewcock defends Yang to some other officers. Interestingly, both Chapter 5 and the previous chapter had the same number of pages (at least, in the English translation). Then again, they also added that car chase scene in the previous episode, so I guess it pretty much evens out. I wonder what they'll add to the next one to fill up the space when Chapter 6 material runs out. I hope it's Phezzan and Adrian Rubinsky. We see what will later be known as the "Yang Fleet" start to take shape when our tea-loving tactician begins to build his staff. He chooses some people that he already knows and gets along with, but are also competent. 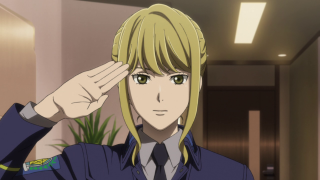 We get to see an adult Frederica Greenhill for the first time, and her character design (much like Murai's) is incredibly different than in the OVA, where she has kind of a lady mullet. The novel describes her as having wavy hair, which... I don't know, I guess she has wavy hair? Sorta. Her eyes are hazel like in the books, too. I suppose you could describe the OVA version as having those same characteristics, but stylized differently. Bewcock looks less haggard and worn out in this version, closely resembling the character design for Fischer (though his skin is tanner). I can't imagine there'll be all that many instances of characterization, unfortunately, because this series only covers the very first novel. 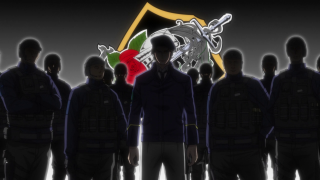 The big deal in this episode is the introduction of the Rosen Ritter regiment. They're the Free Planets Alliance's badass rogues, a group that's difficult to command the respect of. Frederica had to use her physical strength and skill to subdue a particularly rude one at their base, and none of them seemed to be that impressed with Yang, despite his heroic status among some. Their leader, Walter von Schönkopf, is one of my favorite characters in the books and OVA. The OVA depicts him as a very masculine, but dashing guy with a square jaw, strong nose, and thick eyebrows. He likes to make wry observations and act as kind of a devil on Yang's shoulder, projecting on him visions of ambition which Yang swats aside. In the novel, they introduce him being talked to in Yang's office. In the OVA, they show him punish some jackass in the mess hall. In this TV series, they show him among his men in a gym-like area, making Yang come to them and see how the wild men would be difficult to tame. But honestly, his character design in this, his demeanor, and his voice seem to paint him as an arrogant pretty boy with muscles. His voice is too smooth. Not a big fan of this version thus far. Still, I guess I'll give him some time. That brings us to the Death St---I mean, Iserlohn, that big space station that separates FPA and the Empire's territories in a space corridor. In the novels, it's a bit more of just a solid, visible station, rather than a semi-cloaked one as in the OVA or here. 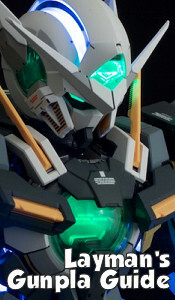 I wonder if it'll have that liquid metal exterior like the OVA, too. It's a pretty neat place, there's like a little city in it, with a park. The Empire really out did themselves with this base. Though it's stationary, unlike the Death Star, keeping guard so the Alliance doesn't invade. We'll be seeing a lot more of it in the future, and I wonder what the Thor's Hammer will look like. Not much to say in terms of the quality of this content. There's a lot of interesting elements at play here, but it's mostly set up. 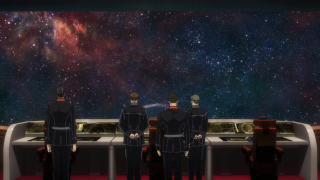 Legend of the Galactic Heroes: Die Neue These can be watched on Crunchyroll.